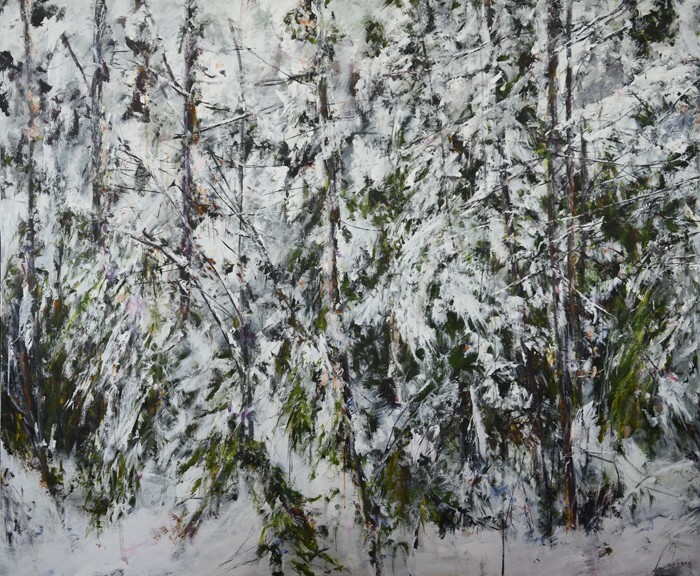 Judy Cheng’s paintings are, in a sense, the antithesis to prevailing notions of landscape painting. She doesn’t depict rolling hills, grand vistas, peaks, and clouds, rather, she offers a study of what the landscape is really composed of. Under the tutelage of her close friend, legendary Vancouver artist Gordon Smith, Judy’s evocative, energetic pictures point their gaze downwards and straight ahead into the thickets. As she wrestles with the raw canvas, everything is brought directly to the front of the picture plane while pockets of space and depth are discovered and carved out of the composition. The branches, bushes, dirt, sticks, snow, leaves, and flowers jostle for position, crafting a dense, rhythmic mosaic. A result is an act of honest landscape painting. Using her brush, Cheng signifies all the energy and vitality of natural life out of a seemingly innocuous patch of grass. A stroke of brown perfectly emulates the essence of a twig, it is in this seemingly impulsive application of paint that her marks begin to take on a meaning closer to that of reality; resembling structures of arrangements in nature that we find in any forest, along any path – a network of deeply layered and complex randomness which exists wherever we might choose to look. Judy’s upcoming exhibition begins Saturday, November 1st. Please contact the gallery (info@iantangallery.com or 604-738-1077) if you wish to preview the exhibition at Ian Tan Gallery – Vancouver Art Gallery. Thanks.